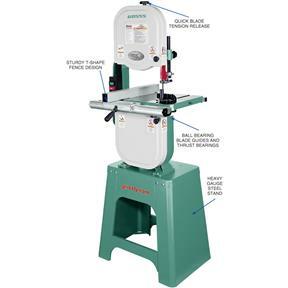 When we first introduced this bandsaw, it redefined the 14" Bandsaw market, incorporating many features that were either optional or simply unavailable as standard items on other 14" bandsaws. Now, with well over a decade of proven performance and long-term customer satisfaction, it continues to live up to its name. CHECK IT OUT FOR YOURSELF! 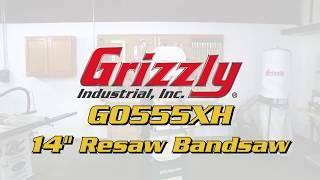 There is absolutely no other company in the world with a larger selection of bandsaws than Grizzly. 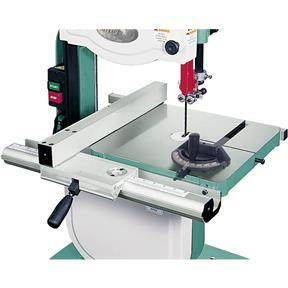 We know bandsaws inside and out and our many years of selling them and supporting them after the sale continues to make this incredible machine an easy choice. You will not be disappointed! CSA certified meeting Certified to UL & CSA standards! Floor to table height: 43-5/16"
Approximate shipping weight: 199 lbs. I am very happy. 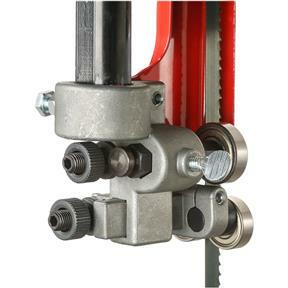 I have been in the construction industry for over 35 years, but have had little experience with band saws. 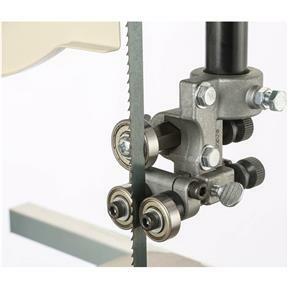 I can tell that this is a very good quality tool and look forward to the many things I will build using this band saw. I have only had it for 4-5 weeks. So, I still have a lot to learn about the actual use and capabilities of this saw. I am glad I paid up in this newest addition to my modest personal shop. I know I will be happy with this purchase for many years to come. Shipping issues caused receipt of initial purchase to arrive damaged. Grizzly was on it and did everything they could to remedy the situation. Will continue to purchase from them in the near future. I received my order within a week with no problems. Unboxed it and put it all together in less than an hour. No hardware was missing which made assembly easy. The only difficulty I had was cleaning the rust preventer off the table. It had dried on it, which I have not ran into that before, but I put some go-jo on a rag and it came right off and looks perfect. I've had the G0555 saw for a few weeks and have done a couple of small projects. Set up was easy because I used a hoist to set the saw on stand. So far so good. I put a better blade on it and that was an improvement. There was some hidden damage by UPS freight that doesn't effect the operation of the saw. Looks like they stacked something heavy on the saw carton. The saw was packed well but not well enough to defeat a freight company. I'm 68 years old and have tons of woodworking tools and machines. But I never had a bandsaw, until now. I can't believe that I waited this long to put a relatively inexpensive and highly productive tool like this in my shop. I won't be without one again. This is a nice unit that has everything you need in a smaller scale. Its a handy size that can easily be moved around the shop. Arrives with cord and plug, ready to use after setup. Shipping crate was adequate, assembly was pretty easy. It's too heavy for one person to pick up and put on the stand, but two might do it. I was alone, so I assembled it laying down and then stood it up by myself. Overall quality seems fine. The blade is kind of crappy, but I understand most serious woodworkers like to order higher quality blades anyway. 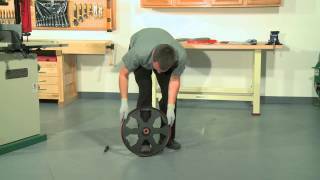 Instructions for tuning the saw are adequate, even for a first-timer. I shopped the used market hard online, but the savings for a beat up used saw did not justify buying used over new, It's a pleasure to buy and use nice tools. This is my third major machine from Grizzly and I have not been disappointed. 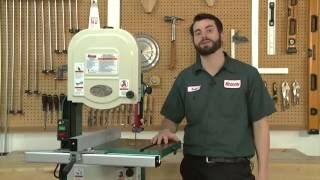 I purchased this saw for my home/hobbyist workshop. I was very impressed with the quality of the construction, packaging, and accessories. 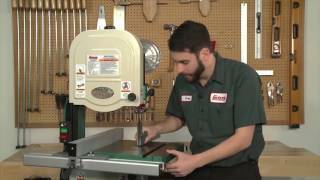 I've used the saw several times since purchase and it cuts great, very powerful, no issues. Would definitely recommend to others...great saw/value for the money. My wife got this for my Christmas. Great product with lots of features for a very reasonable price! I bought this saw because it was fairly priced and got good reviews. So far I'm glad I made the purchase. Assembly was pretty simple took maybe an hour and set up took a few more hours. All bandsaws take time to set up properly though. Only complaint I have and it's minor is the blade that comes with it is poor quality. I replaced the blade and have a very straight cutting saw for a fair price. I've only used the bandsaw a few times but so far I am very pleased with it's performance and quality construction. Got this bandsaw3 weeks ago, as a replacement bandsaw. I have been very satisfied with the quality, workmanship and performance! The quality and craftsmanship is superior to what I expected and the final price was even much less than what I expected. The one problem with the on/off switch was easily resolved and the after-purchase help was very satisfactory. I look forward to a wonderful relationship with my new Grizzly band saw. I am familiar with this saw from many years of using them at work. We cut aluminum from 3/16 up to 3/4 without difficulty, using a nonferrous saw blade.Its also a great price on a great saw that nobody has been able to kill even with daily use. 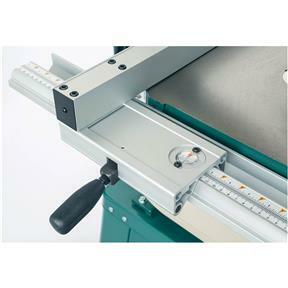 It was a natural go to for me when I wanted a saw that could cut aluminum parts for fabrication. It doesnt run slow enough to cut steel but thats not what I bought it for. 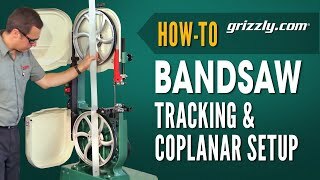 Grizzly does a great job with their band saws and this is no exception. Great quality! Looking forward to years of use. This is my second bandsaw and it is head over heels better than the WEN I had. I have no issues with this saw and would recommend this to a friend or relative. I bought this about a month ago. I've done a couple projects and it works like a champ. Very happy with this purchase. I'm going to be getting some additional blades for tighter cuts, but I have no complaints about the saw itself. I'd gladly buy from Grizzly again. A good value and delivery was on time . Has been a great addition to my shop! Other than the two issues with shipping, it's been a great experience. I would have appreciated more issue resolution, or even a blade package would have been greatly appreciated for the weeks of lost work, caused by your carrier! This has to be the best buy on the market. I looked at six different machines and decided on this one. It is extremely quiet and well-built! It was easy to assemble and just a few minutes minutes of adjusting the blade tension I was up and running. This machine has already paid for itself by increasing our production. I am very pleased with my saw. You can tell it is very well made and I am looking forward to using it for a long happy time! It is everything I wanted in a band saw, great machine! To me, it's the Porsche of Band-saw's ! Works as it should, although parts of the stand were damaged prior to packaging and shipment. Specifically, there was a saw cut in the base of the stand and the area around this cut was bent including the plate for one of the feet. Further the paint on parts of of the base were scraped and chipped. Worked great for a while. Then the two all threads with nut that screw into the top block with spindle fell out. They are only tapped about 2 threads deep and had been locked in with what looks like epoxy. The all thread pulled the epoxy out, it didn't unscrew. The block is thick enough for adequate thread depth but obviously someone took a shortcut in making the part. When this happened blade came off, jumped off guides, and will not track any longer. I will try to re-drill and tap but the part is hardened so we'll see how it goes. Not happy camper at this time. I had been using a very old 12" band saw in need of repair. I knew i was upgrading, but this saw exceeded even what i'd hoped for. Clear directions (i love owner's manuals) and easy set-up. Runs quiet and smooth. Highly recommend. Works just fine. Does exactly what I bought it for. Had this for a couple of weeks...it has sped up several of my projects significantly! Product was delivered quicker than expected, packaged very nicely, and assembly was straight forward. Spend some time tuning and you wont be disappointed. 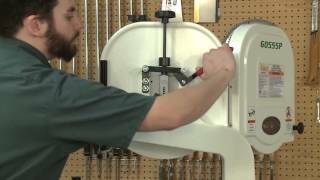 Great bandsaw, very easy to put together. The adjustments you can make on it are simple and thorough. Works much better than my old Delta bandsaw and much quieter. Only concern is that you are forced to pay the $40 or what it was for delivery on a truck that has a lift gate. Problem was I paid but it was delivered without a lift gate so we had to lift it out of the truck. The driver noted it on the receipt but I haven't heard or seen a refund. Hopefully grizzly will come through since I enjoy their service and tools. This is a good starter saw (my fist). The container arrived looking a little worse for wear, but the machine was just fine. The instruction manual provided made set up a breeze. From unboxing to first cut took maybe 2 hours. I recommend buying additional blades with purchase, the one it comes with is garbage, like trying to cut wood with a string. Other than that, great starter saw for the price, it has served me well thus far and will continue to do so. I was looking at several saws, decided on this one. Have been real happy with my choice. It's built well, was easy to assemble and runs smooth. This is a great saw. Couldn't bring myself to buy a little one from the box store. Didn't need a $1200 one. This does more than I'll likely ever need and it does it very well and at a great price. I bought this three months ago. It took a few hours to get it up and running. But, man it was worth it. The machine is a beast. It has handled everything i have thrown at it with out bogging down at all. Very powerful. 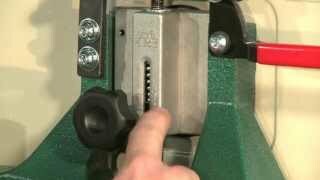 The fence system is a dream and provides for very accurate cuts w/out drift. 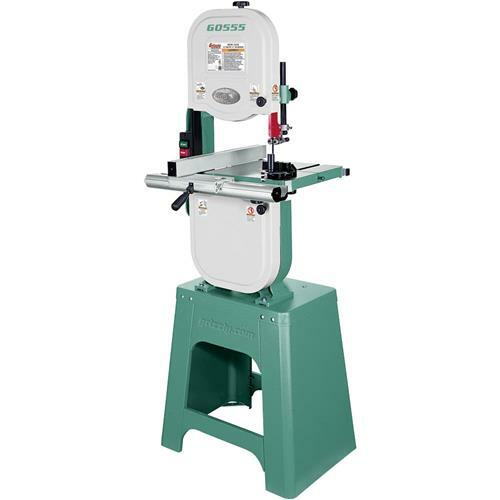 Love this bandsaw and highly recommend it for anyone needing a solid product and does not have deep pockets. I am very pleased. I bought the G0555 Ultimate band saw. It work great. I showed it to my brother and he is seriously thinking about buying one for himself. That it if I can get him to quit using mine. I'm very happy with my bandsaw. I use it now more than my table saw. It's easy to use. I had an old cheap bandsaw for many years that I only used for simple small cuts because I really couldn't rely on it to give a clean straight cut. This is the second most expensive tool in my woodshed (table Saw most expensive) and I do not regret the decision at all. I have discovered all the great things you can make and the utility of a good bandsaw. I am so impressed with the quality. This will be something I will pass down to my son for him to use for many years after I am gone. I've made a couple of blade changes and am soo impressed with how easy it is. The Grizzly videos are fantastic! I was really worried about the delivery, but it turned out great! I would definitely purchase the lift gate option when you place your order if you live in a residential area. The box is big and bulky. I did need another person to help lift the bandsaw out of the packaging and onto the platform. I am a sizable individual and can lift heavy weight (thought 200lbs would be no problem), but the bandsaw is really bulky and doesn't really have a great place for one person to grab and move. Peace of cake for two people!! 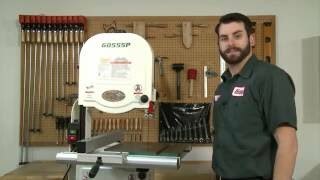 I have had saw for little less then a month and would buy again and am recommending it to my other friends who do woodworking too! They of course want to use mine! Very happy with the bandsaw, the quality is very good. My only complaint is the packaging for shipping. You need to lose the styrofoam. I had to pay ten bucks to get rid of it. There must be a packing product that is made from a paper or cardboard product that is recycleable. great directions,smooth cutting. great quality. I make wood toys for sale. Paid for the saw the first week. I've enjoyed making about 30 bandsaw boxes with the 14" Grizzly. The tension release lever works well and tracking is reliable. It makes compound cuts through 5" thick mahogany without hesitation. The saw is great. I have enjoyed using it and look forward to many years of use. This is one sweet band saw. Anyone who has ever used a band saw would be very impressed with this saw. Well built with smooth operation. The re-saw fence is built with a serious woodworker in mind. The set up was simple and went quickly. 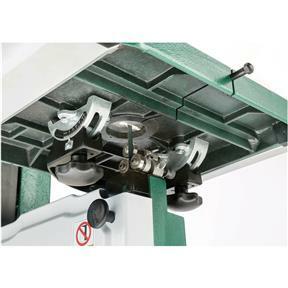 Changing blades is easy and has all settings that are required for use of a variety of blade sizes. I will be putting this machine through the paces and I am sure it will stand up to my needs. Good looking too !! Great product!! Well made and at a good price. I have several Grizzly products and I highly recommend them and their service. the go555 really works great and is very sturdy.i had it assembled in less than an hour the directions were simple and straightforward.if there is one thing that could be better it would be the wheels.i had to place a couple washers on the bottom wheel. Powerful, quiet, extremely true cutting! 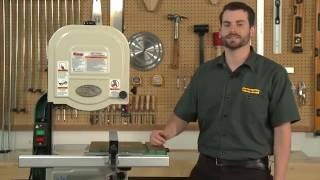 Best band saw I ever used! My saw was delivered today. UPS showed up earlier than I expected which was alright by me. The instructions to assemble were on point and easy to use. Didn't take long and I was in business. Cuts great and very quiet. I have several projects and can't wait to get started. The only problem I had was delivery. The shipper wasn't set up to bring it to my home so I went to the trucking terminal. The next day, I took it out of my car piece by piece so I could get it to the basement with me and my daughter. Not a big deal. The instructions were perfect....as good as I've seen. First thing I did was rip a 4x4 into about 1/8 strips with the stock blade, The surface looked lousy (not really the right blade for the job, but the thickness was uniform from the first cut to last. Hopefully, it keeps humming along, but, honestly, going through the assy work taught me a lot about setting up a bandsaw properly. Nicely done, Grizzly! Saw was easy to put together and set up. Love how it works and next time I need a tool I'm looking at Grizzly. I purchased the G0555 Band saw in January and I am another satisfied customer. The saw is great! It is a fine piece of machinery. The set-up was easy. The instructions were clear and concise. The operation of the machine is perfect. It is also a quiet machine. I can listen to my radio while using the saw! I use it for cabinet making. The table and fence are sturdy. The on and off switch is intelligently located in an intuitive position. The re-saw capability is impressive. It cuts hardwoods without difficulty. 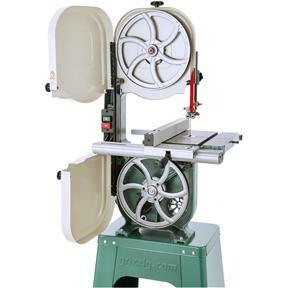 I heartily encourage anyone who is in the market for a band saw to look no further than Grizzly. I plan on making a pilgrimage to your showroom in Missouri. (Yep, I am a convert to Grizzly equipment!). Thank you for making quality products. I just wanted to take a moment to commend Grizzly for not only putting out a great product line but for also providing the very best in customer service. I ordered the G0555, Ultimate 14" Bandsaw from you and had it in my workshop in less than a week. Not only did it arrive in perfect condition, it arrived packaged in a way that made it easy to assemble. Now for the saw itself. Wow! What a product. After some very easy adjustments this saw performs as advertised. Granted, I'm not Mr. Woodworker but I have been enjoying woodworking for many years and this bandsaw makes cuts so much easier and is 100% accurate. 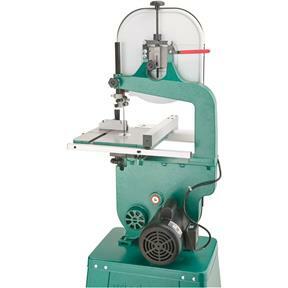 I highly recommend this saw to those who desire and are in the market for a 14" bandsaw. You certainly won't be disappointed and the price can't be beat. Again, thank you so much for a great buying experience. I am pleased to say, "You now have a customer for life". I wanted to yet you know that my recent order of a 14" bandsaw arrived in 100% perfect condition. The packing was outstanding. The UPS Ground trucking company delivered on time and with a smile. 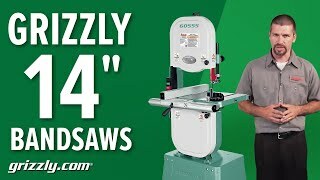 I recommend Grizzly to all my woodworking friends. I received your saw and set it up over the weekend, and am impressed. Compared to my table saw, this is a piece of fine machinery, just like it says on the box. All the directions were clear and set up was intuitive, very happy with your product. I haven't set up the 12 inch extension yet, but expect that to be as easy as the rest. Many thanks for a fine engineered product. Q: What are the key differences between the various G0555 Series machines? 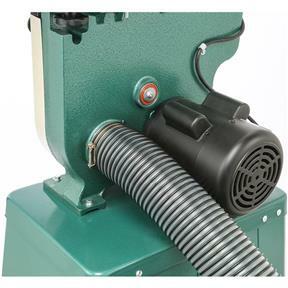 A:Aside from paint color and labeling, the G0555 and G0555P are identical machines; they are equipped with a 1 HP motor, aluminum wheels, manually-adjustable guide post, extruded aluminum fence, and open-style stand. The G0555X was built with the same basic design as the G0555/G0555P, but it is equipped with a 1.5 HP motor, cast-iron wheels, manually-adjustable guide post, a cabinet-style stand, a worklight, and a cast-iron fence with optional resaw fence attachment. The G0555LX and G0555LANV, aside from appearances, are also identical machines; however, they are built from a different design than the G0555/G0555P, so very few parts are interchangeable. The G0555LX and G0555LANV are equipped with a 1 HP motor, cast-iron wheels, extruded aluminum fence, rack-and-pinion adjustable guide post, open-style stand, and a padlock for the ON/OFF switch.